I was unsure what I was going to do for this weeks prompt, the colour wheel. I love colour, rainbows in particular but struggled with doing another quote again. I used gesso and then watercolour crayons for the background and placed a stencil down and wiped with a baby wipe. I used a butterfly stencil and black acrylic paint. I was inspired by Terri Larue as she used paint samples, so I used them for the flowers and letter tiles. 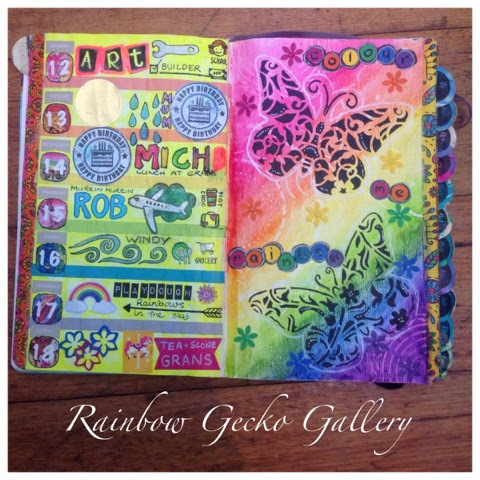 The quote says "colour me Rainbow" and my week three challenge page was complete.